In March 1912, in the former office of Nikolai Rubinstein, the founder of the Moscow Conservatoire, amuseum was opened. Already then its small display was a curious collection of various musical relics such as written music, manuscripts, memorial articles, musical instruments, and works of fine arts. However, it was only in the Soviet period that the museum became really popular. Its funds were expanded and its research and educational work became active. In 1943, the Soviet government decided to set up a State Central Museum of Musical Culture on the basis of the Conservatoire's museum. In 1954, when the country's musical circles marked the 150th anniversary of Mikhail Glinka's birth, it was named after the great Russian composer. Soon the museum moved to an old mansion known as the Boyar Troyekurov's Palace, and in the summer of 1985 its display was inaugurated in a new building constructed specially for the museum. Today the Glinka Museum of Musical Culture is one of the country's largest museums, an authoritative scientific institution and a major centre of musicology and the history of music. Preserved and studied in its depository departments are exceptionally valuable rarities such as written and printed music, musical instruments of various periods and peoples, memorial articles, and works of painting, sculpture and decorative and applied art. These unique historical monuments reflect the development of Russian and Soviet musical culture and unfold the pages of the lives and creative work of outstanding composers, practical musicians and music scholars. No other country of the world has a musical museum of a similar scope, and it is not accidental that the Glinka Museum of Musical Culture is the central one among dozens of Russian musical museums. Late in the XIXth century, several noted Russian musicians and music scholars donated rare musical instruments, which they possessed, to the Moscow Conservatoire. For example, a major addition was the famous collection of folk instruments of Central Asia and Kazakhstan gathered by August Eichhorn. Vladimir Odoyevsky bequeathed a grand piano of a special (enharmonic) design to the Conservatoire. 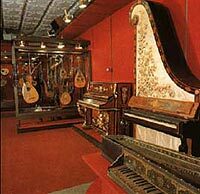 Thus the Museum of Musical Culture's collection of instruments was started. Today it numbers over 2,500 specimens. The collection has become an object of thorough and comprehensive investigation by musicologists, and nine hundred instruments have been used to form the museum's permanent display styled Musical Instruments of the Peoples of the World. The display, laid out in five exhibition rooms, features musical instruments from all the regions of the world, as well as folk and professional instruments from more than 50 foreign countries. The gems of the display are genuine Novgorodian gusli of the XIIIth-XIVth centuries, a collection of silver wind and percussion instruments awarded to military bands as tokens of honour in commemoration of victories of the Russian army in the early XIXth century, and a balalaika made by the master Semyon Nalimov, which was owned by Vasily Andreyev, the founder of the first orchestra of Russian folk instruments. The exhibits representing the general European professional tradition include a violin made by the great Antonio Stradivari (XVIIth century), which was donated to the museum by David Oistrakh's family; XVIth century Italian spinets; unique lutes, mandolins and guitars, including a guitar owned by Fyodor Chaliapin; a rare specimen of a crystal flute; aeolian harps; and music boxes. On display is one of the first electrophonic instruments, Termenvox, whose inventor Lev Termen demonstrated its sound to Lenin. The atmosphere of a Violin Maker's Workshop is re-created in a vivid and interesting way. Its appointments and tools feature articles owned at one time by the noted violin maker Yevgeni Vitacek. This department has an extensive collection of material which is of great interest to musicologists, textual critics and practical musicians. Preserved and investigated here are musical autographs by Mikhail Glinka, Pyotr Tchaikovsky, Modest Moussorgsky, Sergei Rachmaninov, Sergei Prokofiev and Dmitri Shostakovich, letters and other documents related to Wolfgang Amadeus Mozart, Ludwig van Beethoven and Gioacchino Rossini, manu script song books, and memorial articles. For example, a collection devoted to Fyodor Chaliapin covers all the periods of his creative work. The material of the funds of manuscripts and works of fine arts is used in setting up various exhibitions, which are displayed both in this country and abroad. The museum has shown its collections in Czechoslovakia, Hungary, Bulgaria, France, Italy, Canada, Finland, the Federal Republic of Germany, and Japan. The library's fund numbers more than 200,000 items, including books, orchestral and piano scores, and collections of unique publications such as editions of works by great composers published in their lifetime, sheet music with autographs by Modest Moussorgsky, Pyotr Tchaikovsky, Franz Liszt and Camille Saint-Saens, Sergei Prokofiev and Dmitri Shostakovich. The library has quite a few items that are true museum pieces, yet a major part of its fund is constantly in use. The museum's library affords rare opportunities of getting scientific information in the field of musicology and the history of music, attracting numerous Soviet and foreign scholars. Its collection could well make up a display of an art museum. Paintings by Vasily Perov, Nikolai Ghe, Mikhail Vrubel, Alexander Benois, Nikolai Roerich, Boris Kustodiyev, Kuzma Petrov-Vodkin, Martiros Saryan, Fyodor Fyodorovsky, Vadim Ryndin, and many other celebrated masters are a pride of the Museum of Musical Culture. The depository's collection featuring portraits of noted musicians, scenery sketches for opera and ballet productions, sculptures, and works of graphic and applied art boasts of hundreds of exhibits marked by a high artistic value. The depository has a special section comprising priceless documentary photographs that show certain moments of the lives and creative work of great musicians of the XIXth and XXth centuries such as Alexander Borodin, Sergei Rachmaninov, Fyodor Chaliapin, Igor Stravinsky, Dmitri Shostakovich, Leonid Sobinov, Aram Khachaturian, and others. Those wishing to listen to all the records that the museum's sound library contains would have to spend several years in front of a record player! Gregorians chants. Renaissance music, musical folklore from all the regions of the world, recordings of compositions by Alexander Scriabin, Camille Saint-Saens and Richard Strauss, Sergei Rachmaninov, Nicolas Medtner, the voices of Antonina Nezhdanova, Leonid Sobinov, the performance of David Oistrakh, Miron Polyakin, Konstantin Igumnov, Vladimir Sofronitsky and many thousands of other products of domestic and foreign record companies gathered over the entire period of their existence - such is the sound library of the Glinka Museum of Musical Culture. Here Soviet and foreign musicians perform and subscription subject-oriented cycles of concerts and lectures, musicales featuring archival sound recordings, meetings with creative personalities and gatherings of musical circles take place. The programmes of concerts held in the hall range from lute and clavier music of the Middle Ages to works by modern composers. 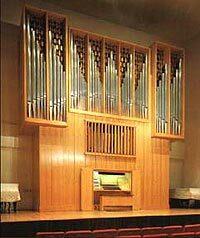 In 1979, a unique organ was built by the firm Schuke-Potsdam (the German Democratic Republic) specially for the concert hall.